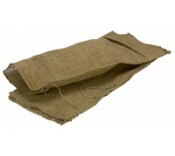 Polypropylene Sand bags with tiestring 750mm x 325mm supplied empty Manufactured from woven ..
Hessian Sandbags with tiestring. 750mm x 340mm and are supplied empty. The hessian sandbags.. Whether you are looking to control water levels on the work site, protect against the threat of possible flooding or serve as a foundation for new levees – sandbags have a multitude of uses on construction sites. Their versatility make sandbags an important inclusion when purchasing equipment for all manner of worksites. At Manchester Safety Services, we stock a selection of polypropylene and hessian sandbags which are designed to offer durable and robust support for a variety of tasks. The versatility of the materials used to produce the sandbags allow them to quickly and efficiently offer comprehensive support. Starting at just £0.25 per unit, the sandbags in the Manchester Safety Services range are incredibly affordable – allowing you to stock up for less. If you have any additional questions about the sandbags from Manchester Safety Services, please contact our dedicated team on 01706 364943 and we will endeavour to help in any way possible.